What both players calculated during the endgame and postgame has been reported in detail on this site. 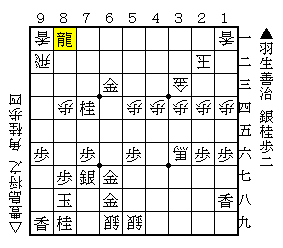 It is said that △P*66 was losing move for gote at #102 because sente had the decisive attack at that moment. 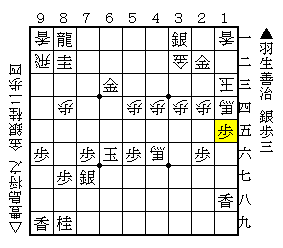 At first, challenger Toyoshima had been thinking △P*71 and △G-32 as candidate moves. But, in the case of △P*71, after calculation with ▲G*53 △N*85 ▲+Rx92 △Lx ▲R-62 △K-23 ▲S*22 △P-25 ▲Px △+Bx ▲P*26 (Diag.1), he couldn't have any confidence in the position. And, in the case of △G-32, it proceeds to quite complicated positions. After calculation with ▲N-82+ △Sx68 ▲Gx △G*78 ▲Gx △Sx+ ▲Kx △B*69 ▲K-67 △B-58+ ▲K-66 △+B-46 (Diag.2) ▲S*31 △K-23 ▲N*15 △Px ▲G*22 △K-13 ▲S*14 △+Bx ▲Px15 (Diag.3), he was not sure which side was winning at Diag.3, and then finally evaluated the position as not good for gote. 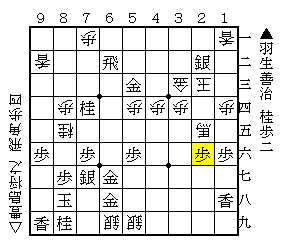 Thus, although he chose △P*66, as the result, △P*66 became a losing move. 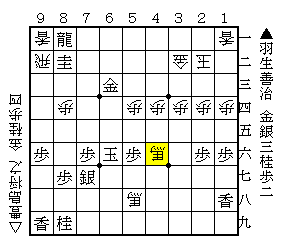 Habu considered the position as a very close game. At Diag.2, △+B-46 is a threatmate with △+B58-57 ▲K-65 △+B57-56 ▲G*43. If the king run above like △K-75, the rook will be utilized by △Rx82. The sequence from ▲S*31 to ▲Px15 is the technique for removing the threatmate and giving a threatmate to the opponent's king reversely. The other ways for gote to deal with the check would lead to a checkmate. At first glance, you may think sente is winning at Diag.3. But, after this position, a lot of variations still exist. They are written in detail on the website. Please check it out. Very interesting analysis of an complicated ending. Makes it possible to understand the thoughts of the players in a top title game. Thanks a lot!